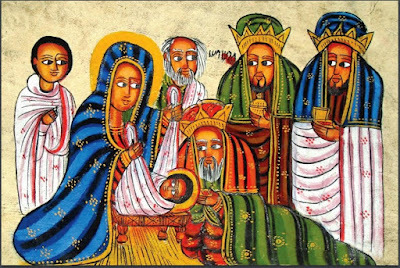 We are still in the weeks of Epiphany that continue the Season of Christmas, and my photograph of an Ethiopian icon of the Visit of the Magi continues to find use for Epiphany-themed occasions in the US. Earlier this month [5 January 2016], it was pleasure to see this photograph used to illustrate the front cover of a Presbyterian Church magazine, Peaks Postings, the magazine of the Presbytery of the Peaks in Virginia. Yesterday [20 January 2016], I received a copy of an Epiphany card sent out by Bishop Jeffrey Lee using the same photograph for his Epiphany seasonal greetings to the Diocese of Chicago in the Episcopal Church. Bishop Jeff has been the Bishop of Chicago since 2008. He was born in Michigan and was raised in a Lutheran family. At an early age he was urged by his pastor to consider ordained ministry, and as a young man he joined the Episcopal Church. After he and his wife Lisa were married in 1979, they moved to New York, where they both worked as buyers for Bloomingdale’s. But the juxtaposition of wealth and extreme poverty that they saw side-by-side in New York led him to decide to pursue ordained ministry, and he studied at Nashotah House in Wisconsin. After he was ordained priest on 1985, he served as the canon to the ordinary. He also worked in church development, and started a suburban congregation near Indianapolis, Indiana. Bishop Jeff worked as a rector with declining parishes in both Wisconsin and Washington before he was Bishop of Chicago. He was chosen from a list of eight nominees, and when he was consecrated by Bishop Katharine Jefferts Schori on 1 February 2008, he was the 1,026th bishop consecrated for the Episcopal Church. 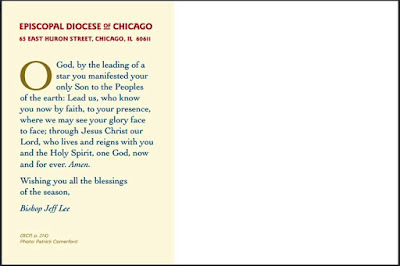 A major event during his episcopacy has been the reunification of the Diocese of Chicago with the Episcopal Diocese of Quincy. In 2008, a majority of laity and clergy in the Diocese of Quincy left to form a diocese in the more conservative Anglican Church in North America. The remaining Episcopalians in Quincy reformed their diocese and in 2012 they approached Bishop Jeff and the Diocese of Chicago about the possibility of reunification with Chicago. In November 2012, the convention of the Diocese of Chicago agreed that reunification should be pursued and on 8 June 2013, both diocesan conventions voted unanimously to reunify. 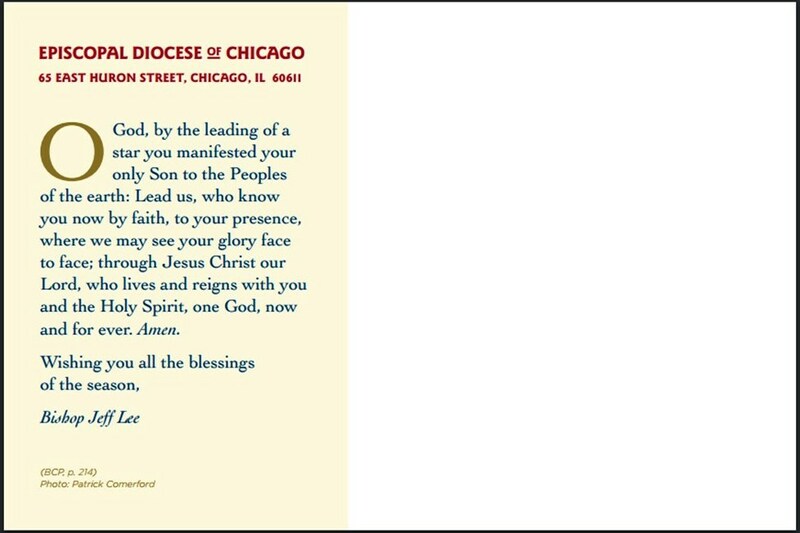 The reunification was ratified by a majority of the bishops and the standing committees of the Episcopal Church, and on 1 September 2013, the Diocese of Quincy merged into the Diocese of Chicago as the Peoria deanery. Despite the decision of the Anglican Primates at their meeting in Canterbury last week, all of us are going to find that our friendships with individuals and dioceses in the US cross many of the boundaries that others would try to raise, and that there are pleasant surprises in the way they bear creative fruit. with you and the Holy Spirit, one God, now and for ever. A special conference has been organised in Cambridge next month [February 2016] to mark the 90th anniversary of the founding of the Saint Sergius Orthodox Theological Institute, Paris, and the recent publication of the first Agreed Statement of the International Commission for Anglican-Orthodox Dialogue, In the Image and Likeness of God: A Hope-Filled Anthropology. 11:00-12:00: ‘The Healing of the “Terrible Wound”: Anglican-Orthodox Encounters in the Early History of the Institut Saint-Serge’, Dr Brandon Gallaher, University of Exeter. 12:00-13:00: ‘Orthodoxy, Anglicanism and Sophiology,’ Professor John Milbank, University of Nottingham. 13:00-14:30: Lunch, with an opportunity to visit an exhibition of liturgical books in the Wren Library. 14:30-14:45: Screening of archive photographs and footage from the St Sergius Institute. 14:45-15:45: Panel Discussion, chaired by Metropolitan Kallistos Ware of Diokleia (to be confirmed). 15:45-16:45: ‘Sergii Bulgakov and Vasilii Kandinskii: Two Visionaries of the Wisdom of God,’ Dr Antoine Arjakovsky (Collège des Bernadins, Paris). 17:00-18:00: Drinks Reception, Old Combination Room, Trinity College. The Institut de théologie orthodoxe Saint-Serge (St Sergius Orthodox Theological Institute) in Paris is a private Orthodox school of theology founded in 1925. The mission of institute is to form educated priests and laypeople intending to serve the Orthodox Church and to represent it in ecumenical dialogue. It is under the canonical jurisdiction of the Russian Orthodox Exarchate in Western Europe, and is supported by the Ecumenical Patriarchate. Soon after the institute was founded, the Fellowship of Saint Alban and Saint Sergius was founded in 1928 to foster relations between the Anglican and Orthodox traditions. It is based in Oxford, publishes the journal Sobornost and organises an annual conference. Orthodox-Anglican dialogue is in fact the oldest of all ecumenical relationships, and dates back to 1862, over 60 years before the institute was founded. Patriarch Meletios Metaxakis recognised Anglican orders in 1922. Patriarch Meletios, who was born in Crete in 1871, served as Ecumenical Patriarch from 1921-1923. He was the only person successively to lead four autocephalous Orthodox Churches: Cyprus, Greece, Constantinople and Alexandria. In 1918, he became Archbishop of Athens, and as Archbishop of Athens he visited England for talks between the Anglicans and the Orthodox Church. However, he was deprived of this see at the end of 1920, and he fled to the US in February 1921. As Ecumenical Patriarch Meletios IV, he secured the declaration from by the Patriarchate of Constantinople accepting the validity of Anglican orders in 1922. However, under pressure from other Orthodox bishops to resign, Patriarch Meletius IV left Constantinople in 1923 and subsequently retired as Patriarch. He was elected Pope and Patriarch of Alexandria and All Africa and was enthroned as Meletios II of Alexandria on 20 May1926. He remained in office in Alexandria until his death in 1935 and was buried in Cairo. Before these controversies, the Eastern Churches Association was formed in 1864, to work for the union of the Anglican and Orthodox Churches, and in the aftermath of the Russian Revolution in 1917, the Fellowship of St Alban and St Sergius was formed in England. Nicolas Zernov, a Russian exile, organised a series of conferences in St Albans to bring together young Eastern and Western Christian students for theological discussions. The conferences of 1927 and 1928 were ground-breaking for their time. Conference speakers have included Father Sergii Bulgakov, Father Georgii Florovsky and Father Alexander Elchaninov, as well as lay theologians such as Vladimir Lossky and Lev Zander. Until the mid-1970s, the Fellowship of St Alban and St Sergius provided one of the few forums for Western Christians to encounter Eastern Orthodox worship, prayer and thought. Formal Anglican-Orthodox dialogue began in 1973, when the Anglican-Orthodox Joint Doctrinal Discussions first met in Oxford. The first phase of the dialogue was concluded by the publication of The Moscow Agreed Statement in 1976. The publication of The Dublin Agreed Statement in 1984 brought the second phase to a conclusion. Both statements record a measure of agreement on a range of specific topics, while acknowledging continuing divergence on others. The third phase of the dialogue began in 1989, when the commission was re-constituted as The International Commission for Anglican-Orthodox Theological Dialogue and chaired by Metropolitan John of Pergamon and Bishop Henry Hill and Bishop Mark Dyer. This third phase of the dialogue gave further consideration to ecclesiological issues and to Trinitarian doctrine. The fourth phase began in Crete in 2009, and has met in 2010 (Oxford), 2011 (Albania), 2012 (Chester), 2013 (Serbia), and 2014 (Jerusalem). Last September , Archbishop Richard Clarke of Armagh, recently attended a meeting of the commission in Buffalo, US. At that meeting in Buffalo, the commission completed the first section of its work on the theological understanding of the human person, with the adoption of its agreed statement, In the Image and Likeness of God: A Hope-Filled Anthropology. The report is the culmination of six years of study on what Anglicans and Orthodox can say together about the meaning of human personhood in the divine image. The IOCS annual summer onference, which addresses the same theme, is to take place from 29-31 August 2016 at Sidney Sussex College, Cambridge. More details will be made available soon on the IOCS website. The IOCS has also organised a series of Icon painting workshops with Nikita Andrejev for 2016. The Introductory Iconography Course with the Prosopon School of Iconology takes place from Monday 4 April to Saturday 9 April. A second, intermediate Iconography Course with the Prosopon School of Iconology runs from Monday 5 September to Saturday 10 September 2016. The fee for the week is £350, which includes personal tuition and all materials, plus tea and coffee. Advance payment is necessary to secure a place, and numbers are limited to 12 only for each course. Further information is available by email to info@iocs.cam.ac.uk or by mail to IOCS, 25-27 High Street Chesterton, Cambridge CB4 1ND. For more information is also available at the IOCS website: www.iocs.cam.ac.uk.